During the early 1900s, Baltimore sisters Etta and Claribel Cone travelled the world while accumulating one of the world’s finest modern French Art collections for their side-by-side Bolton Hill apartments. Works by Henri Matisse, Paul Cézanne, Paul Gauguin, Vincent van Gogh, Pablo Picasso and other then-undiscovered artists covered their walls. Laces, shawls, sculpture, porcelain, rugs, precious stones and other artifacts covered flat surfaces. 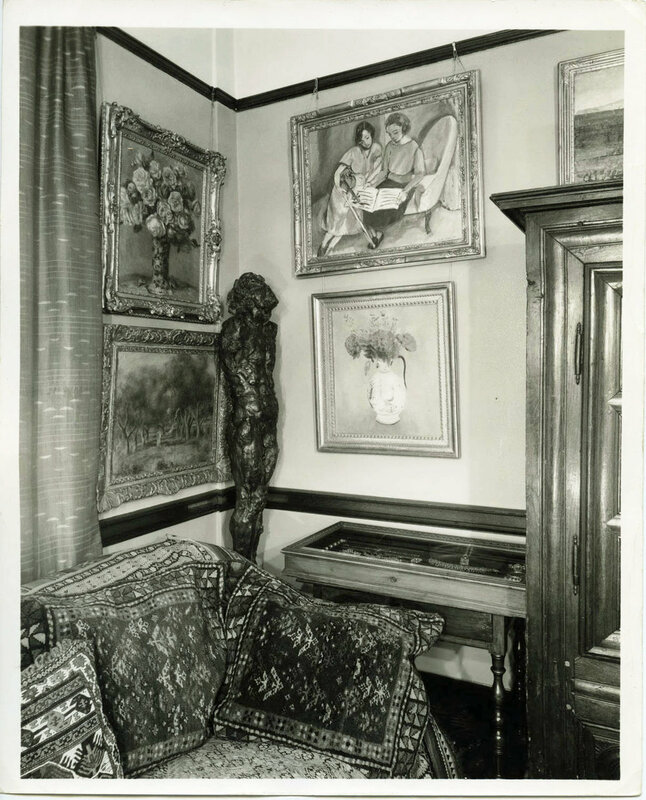 Claribel’s apartment included tapestries, sculptures, drawers full of treasures, as well as Henri Matisse’s The Music Lesson: Two Women Seated on a Divan (1921) on the upper right. By mid-century, both sisters had passed away. Many American museums and collectors hoped to acquire some or all of their paintings and objects. Instead, Etta, the longer surviving sister, bequeathed over 3,000 pieces to the Baltimore Museum of Art. Today, the Cone Collection is a vital part of the BMA and of Baltimore’s identity. Etta and Claribel were two of 13 children born to German Jewish parents, Hermann and Helen Guggenheimer Cone. The family began to build wealth in the textile business in Jonesborough, Tennessee, especially during the World War I years. They relocated to Baltimore when the Cone sisters were school-aged. Etta and Claribel attended Western Female High School. Claribel then attended the Women’s Medical College and was one of the few female doctors of the time. She worked in Johns Hopkins Hospital’s pathology laboratory. Etta was an accomplished pianist and managed her household. Claribel Cone as a resident physician. Among the guests were Gertrude Stein and her brother Leo. The two sets of siblings joined each other in travel to exotic places around the world. In Paris, they struck up friendships with little-known artists such as Henri Matisse and Pablo Picasso, each who had shocked the traditional art world of the time with works of art like none ever seen before. Imagine artists, authors and intellectuals gathered in Etta Cone’s dining room in Baltimore’s Marlborough Apartments. The Cone sisters, whose family’s wealth afforded them the time and money to travel and collect, occupied an unusual place in the art world. It was uncommon for women to amass such an avant-garde collection of art; their tastes were revolutionary and wide. Yet they tended to dress conservatively in Victorian styles, reserving their money for travel and art. The BMA archive contains photos of the sisters’ travels to places such as Italy, Egypt, Gibraltar, Holland, India and Switzerland. Claribel died after becoming ill in Lausanne, Switzerland. On the day of her death, September 20, 1929, she had purchased Rivulet du Puits Noirby Gustave Courbet. Etta mourned her sister, but ensured that the Cone collection continued on. On her own after a lifetime of living with her more outgoing sister, Etta continued to travel. She added to the collection with works that included those of Jean-Baptiste-Camille Corot, Édouard Manet and Paul Gauguin. Her friendship with Henri Matisse grew and the artist often offered Etta the first opportunity to purchase his finished art. The Cone Collection includes over 500 of Matisse’s works, the largest in the world. For Matisse aficionados this vast collection of his works traces the evolution of his style. Over the years, Etta and Claribel built an especially strong friendship with Henri Matisse. He visited Etta in 1930 at her home. Claribel had died the previous year. Despite the interest of many fine museums from around the world, Etta honored the sisters Baltimore roots by bequeathing the bulk of the holdings to the BMA along with $400,000 to fund a new wing to contain it. The Cone sisters are buried together in a vault in Druid Ridge Cemetery. Etta Cone hoped that her massive art donation to the Baltimore Museum of Art would bring awareness of French modern art to the people who lived in the city. Etta died on August 31, 1949.